At St. John the Baptist Catholic School, the library is more than a place to read a good book! Students in Transitional Kindergarten (TK) through 6th grade visit the library weekly. The youngest students in TK - 4th grade enjoy listening to the school librarian, Mrs. Melanie Oberting, read to them. She helps them dive deeper into literacy activities. 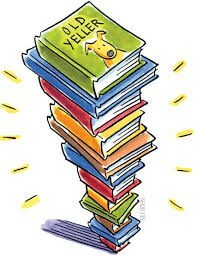 Students in grades 6 - 8 read independently, check out books and find needed resources for class homework or projects. While our younger students are learning reading, our older students are learning to conduct research, and cite and report on information found in our library and its many databases. St. John’s library has high-quality literature for student engagement and resources that support both our students’ academic needs and their extra-curricular interests. Not only does our librarian work in partnership with teachers and students on information literacy, she has opened the library to students during the lunch period. This added bonus allows students to visit the library during recess to read or play board and card games with friends or with Mrs. Oberting! Our library also has a section dedicated to books on Parenting, Catholicism and Christianity. Parents and adults in our parish are welcome to learn more about our faith and how to be successful role models for our children. Once you obtain a library number, you are free to check out books!